The collect and readings for Proper 7C, the Third Sunday after Pentecost, may be found here. The appointed gospel is Luke 8:26-39. Then they arrived at the country of the Gerasenes, which is opposite Galilee. 27As he stepped out on land, a man of the city who had demons met him. For a long time he had worn no clothes, and he did not live in a house but in the tombs. 28When he saw Jesus, he fell down before him and shouted at the top of his voice, “What have you to do with me, Jesus, Son of the Most High God? I beg you, do not torment me”— 29for Jesus had commanded the unclean spirit to come out of the man. (For many times it had seized him; he was kept under guard and bound with chains and shackles, but he would break the bonds and be driven by the demon into the wilds.) 30Jesus then asked him, “What is your name?” He said, “Legion”; for many demons had entered him. 31They begged him not to order them to go back into the abyss. 32Now there on the hillside a large herd of swine was feeding; and the demons begged Jesus to let them enter these. So he gave them permission. 33Then the demons came out of the man and entered the swine, and the herd rushed down the steep bank into the lake and was drowned. 34When the swineherds saw what had happened, they ran off and told it in the city and in the country. 35Then people came out to see what had happened, and when they came to Jesus, they found the man from whom the demons had gone sitting at the feet of Jesus, clothed and in his right mind. And they were afraid. 36Those who had seen it told them how the one who had been possessed by demons had been healed. 37Then all the people of the surrounding country of the Gerasenes asked Jesus to leave them; for they were seized with great fear. So he got into the boat and returned. 38The man from whom the demons had gone begged that he might be with him; but Jesus sent him away, saying, 39“Return to your home, and declare how much God has done for you.” So he went away, proclaiming throughout the city how much Jesus had done for him. Have you ever felt as is the life you are living is not the life you want to live? That somehow your life is not your own or maybe that you have even become a prisoner of your own life? If so, then you have met the Gerasene demoniac, the man in today’s gospel. He used to have a home in the city; now he lives in a cemetery among the tombs. He used to be free; now he wears chains and shackles. He used to have relationships, family and friends; now he has a guard. He used to dress and act like everyone else. For a long time now he has worn no clothes. Today’s gospel offers a vivid image of a man separated from society, naked, bound in chains and shackles, living in a cemetery. It is not, however, simply a description of the man’s physical life and environment. If that is all it were about then some clothes, a homeless shelter, some medications, and a pair of bolt cutters would fix his life. End of story. You and I both know that the real challenges of life are not that easily fixed. The real challenges of life are, more often than not, spiritual rather than physical. The tombs, chains, demons, and nakedness are descriptive of this man’s interior life. They point to a life separated from God, others, and self. They reveal a soul in need of healing, in need of a new life not just a new environment. We do not know how this man of the city came to live in the tombs. We do not know what keeps him chained to the dead. We do not know what has left him exposed and vulnerable, having lived without clothes for a long time. We do not know what demons haunt and possess his life. We cannot tell the story of his life. We do not have to. His story is our story. We can tell the story of our own lives. We could each tell about a time when it felt like we were more dead than alive, naked, exposed, and vulnerable. We could describe what it is like to be a prisoner of our own life, to feel the heaviness of life weighing us down like chains and shackles. We can remember times when we lived outside the security of the city of our family, friends, and relationships. We could describe a time when we just were not ourselves, when our lives became possessed by another person, an event, a thing. The reasons for this are, to borrow a word from today’s gospel, legion. They are many. The pain of divorce or a broken relationship with a child or parent. The grief and sorrow over the death of a loved one. Busyness that leaves us exhausted and isolated. The never-ending pursuit of perfection and need for approval. Anger. Fear. Addiction and the never-ending need for more. Deep disappointment in yourself or another. Guilt that will not allow the acceptance of forgiveness. Resentment and the refusal to forgive. Cynicism that convinces us it is not worth the effort to try again or to look for a new way. Apathy and indifference. Expectations that are never met. The list goes on and on. Eventually we become so attached to these various ways of behaving, thinking, or speaking that they seem to take on a life of their own. They take on power. They possess us. Our life is no longer our own. Not long ago a gentlemen said to me, “My life just is not what I want it to be and I cannot get it back to the way it was. I go to sleep at night asking God to not let me wake in the morning.” He paused for a moment and then said, “But he never does. Here I am again, another day.” He is living in the tombs, not really dead but not alive either. Like the man in today’s gospel if he could just break the chains he would run away. Haven’t you ever just wanted to run away from life? Wouldn’t it be nice sometimes to push the reset button and just start over in a new place, with new people, new work, new ideas, new possibilities. The problem is no matter where you go, there you are. As a friend of mine likes to say, “Mismo infierno, el diablo diferentes.” Same hell, different devil. We cannot escape ourselves. No matter how many times the Gerasene demoniac broke the chains and took off for a new place, he always ended in the same old place. Same tombs. Same chains. Same nakedness. Same demons. It does not have to be that way. Today will be a different day for the man and for us. The demons themselves will testify to the power of God. “What have you to do with me Jesus, Son of the Most High God? I beg you do not torment me.” They beg, negotiate, and seek permission from Jesus. These once life controlling demons are powerless against the One who is Life. God in Christ has ultimate power. Death knows this. Sin knows this. The natural world knows this. The demons know this. Sometimes it seems we are the only ones who do not know this. For some time now St. Luke has been reminding us that only Jesus has ultimate power over our life. Two weeks ago we heard about the Jesus power to restore life as he raised the widow of Nain’s dead son. Death is not the ultimate reality for us. Just last week we watched Jesus’ power to forgive sins and free a woman to go in peace even as others judged and labeled her. Jesus’ power of forgiveness, compassion, love, and mercy is greater than the our power to condemn, label, and judge each other. Our ultimate identity is found in Christ, not in each other’s opinions. 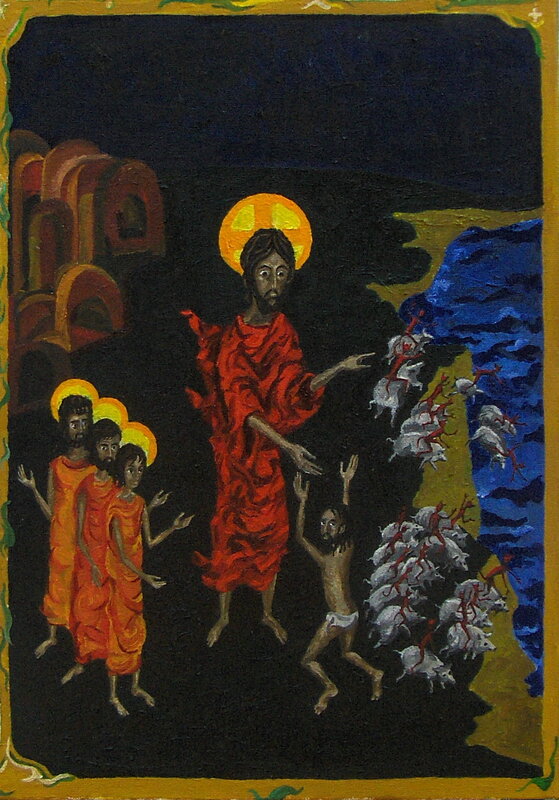 If you read the story immediately before today’s gospel you discover Jesus has power to calm the storms of life, to still the waters and wind that swamp our life and batter our world. This power of Jesus declares that the natural world and the circumstances of our life do not have the last word. Today, Jesus demonstrates power to set us free in order that we might be clothed in his own life and power. There is nothing you encounter in life or death, nothing you have done or left undone, no circumstance of the world around you or the one within you that is not subject to the power of Jesus, the power to restore life, to forgive, to love, to heal, and to carry you through times you cannot bear on your own. In Christ chains are broken, nakedness is clothed, tombs are vacated, and demons are powerless. Remember the man I told you who about who asks not to wake up in the morning? Someday he will realize that every day his prayer was not answered was a day the demons did not win. Every morning he awoke was a testament to God’s power to restore life and offer new possibilities. Every morning his feet touched the ground God’s power had set him free to go in peace. Someday, by the power and grace of God, he will go throughout the city proclaiming how much Jesus has done for him. That is the gospel truth for his life, your life, and my life. Thank you for this reminder of the available mercy and grace for this day. Lord Jesus Christ have mercy on me, save me from the demons that seek to take my life. the illustration (and response to) the man who asks not to wake in the morning is powerful and a wonderful definition of the power and grace of God at work in our lives every new day. thank you. Thank you Robert. For me one of the interesting aspects of the demons is that they both hide and reveal the presence of Christ. The man in the illustration knew only their ability to hide the divine.